Today's blog title has a double meaning. The first is for this spectacular cupcake bead which I turned into a pendant. It's nearly triple the size of most common cupcake beads and the cherry mahogany colors just take my breath away along with the attention to detail from the independent glass artisan. It feels so good to hold this substantial piece. ending their journey with 3 nights in New York City. When I saw this Madonnari chalk drawing of a ship, I just had to take a photo! You can see more fantastic chalk drawings in my previous post, "Travel Items". My dad was stationed on a ship in the navy during the Korean war, but has never "cruised" on a luxury ship. Son: "tastes like frankincense & myrrh". Me (not really wanting to taste THAT, but too curious NOT to!) "oh yuck, it tastes like I licked incense!........and..........dish soap!" We both spit it out and discussed how what was left in our mouth was a hint of freshening possibility but not enough to ever put that in our mouths again! Okay, DAD, maybe you totally scammed us, knowing about this horrid product and wanting to laugh after hearing we'd experienced its devilish qualities....right? Dad? DAD!!!! Oh crud, he's getting ready to LEAVE THE COUNTRY for a month....good move, DAD...perfect timing, DAD. Man, are you ever gonna get it when YOU get back! Dirty rat. Dreamsicle is the cupcake pendant above and Chocolate Pink is below. Continuing on from my previous sweet shoppe post, my Dad and I visited the Mission in my hometown...Mission de Tolosa of San Luis Obispo. A huge tree was recently removed (where that woman is standing) and I wanted to see if any character was lost. I decided there wasn't, plus the bells are new, the building has a fresh coat of white paint...you'd never know it was built in 1772! There has been major retrofitting inside as well. Most of the squares were 6 feet by 6 feet, but the really professional artists had 10 by 10 foot squares, and THIS basketball drawing was so detailed it looked like a photograph. No other work produced that feeling and of course, it's not coming through on this photo. But, the artist used Rembrandt style coloring...which is: when getting very close to the painting, , you see lots of odd colors you don't see in a person's face via the naked eye, but as you pan away you suddenly reach a point where it all works together and you see the final image....and the reason for all those little bits of what seemed like unnecessary colors. Now, this brick work was the ONLY one in the style we were hoping for, where it totally fools you into feeling like you are looking beLOW the surface upon which it has been applied. It feels you are looking down a chimney, right? That is chalk on a completely flat surface...the street, as a matter of fact. Very cool to see in person. And this gumball machine had what I thought was the best use of color. All the chalk was crisp and bright. That's my tour for today, but I've got more since I AM achieving my goal of shorter postings on a more regular basis. Two new Cupcake pendants for you, Chocolate Kiss and Periwinkle Stripe. I realize that when I prepare to write a blog, it can feel a bit daunting which keeps me writing often. Today it hit me that the reason was I would attempt to post lots of photos and discuss several topics. So, now my goal is to post shorter stories and fewer pics...we'll see if we get more bang for the buck. I traveled to my Dad's to meet his fiancee (now his wife..woohoo!). I wanted to talk with him and spend time with her as well. I really like her, she's very comfortable to be with. The three of us drove through the apple farm canyon while crisp leaves fell from the trees. We sampled fresh picked apples and bought bags of them along with fresh, icy cider. Just minutes from there is the ocean and the cutest little village where Dad bought us iced coffee and chai tea which we enjoyed under an umbrella while watching small waves roll in. One day my Dad and I toured about in his little black convertible (top down), checking out new spots downtown. 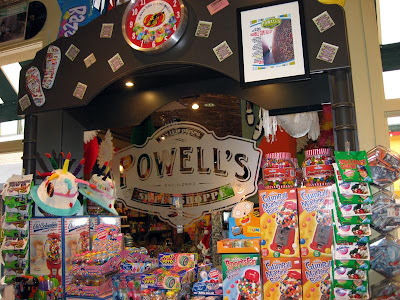 One of my favorites was Powell's Sweet Shoppe. 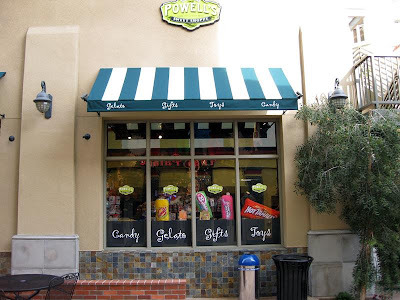 It's not a big shoppe but it is packed with zillions of packages of candy. Nearly one entire wall is floor to ceiling Pez dispensers and refills. Just stepping in the door is a wonder: you see the entire shop from there with its high, tin ceiling and aisles and walls full of candy. Dad and I had such fun at "nostalgia row" oohing and aahing over candies we hadn't seen in years. It was all so overwhelming, I forgot to search for jujubes & jujyfruits which I used to love buying as a kid at the movie theatre. I bought a roll of Necco wafers and Dad got an O'Henry...which surprised me by tasting just like Snickers. I'll tell you a little more later about that day, like the breath mints and the Italian chalk painting. I also have a bunch of cupcake pendants to put up on Etsy, so next time I come back I'll have photos of those too. So, I will see you soon with another "short story". This special cupcake was a customer request. I rarely order a white cake portion but I really like the result. I was so happy with these, I also ordered white cupcakes with pink frosting and black sprinkles as you see in the last photo. The customer and I left the sprinkle color choices up to Lezlie Belanger, the glass artist, and I love how plump and juicy they turned out in transparent colors. Normally, I just make pendants, but the customer had sentimental reasons for choosing these colors and wanted the cupcake mixed with sterling silver so that the recipient would have this work of art forever. It's wonderful to work with jewelry when I know it is intended to become a cherished item. Here they all are lined up nice and pretty. I have 1 green one that will be listed on Etsy tomorrow which will leave one in my inventory. The pinks will also be listed on Etsy, as part of my cancer awareness series, but probably not until next week as I have some traveling to do this weekend.